April is Earth month for Bookmans, because one of our core values as a company is the environment. It makes sense to take care of that which is most important to all of us – Mother Earth. Reuse, Reduce, Recycle has been our mission for 40 years, way before the term global warming was an unfortunate part of our modern lexicon. While we are glad that humanity is beginning to wake up, we have a long way to go. Like Kermit said, “it ain’t easy being green” or orange. The best changes are those that are incorporated into our daily lives, small changes that can have lasting and large cumulative effects. 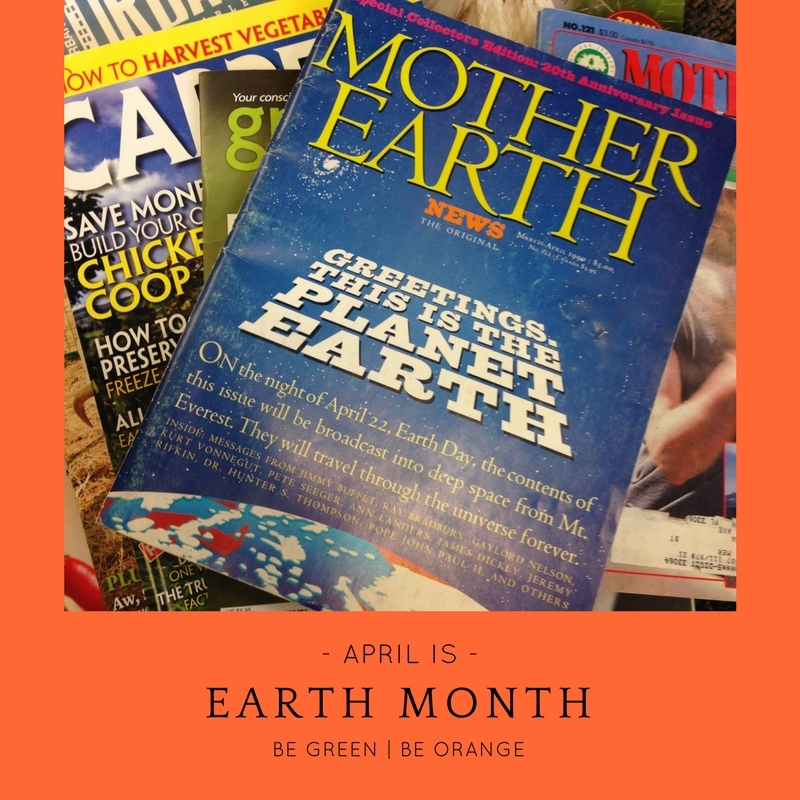 All through the month of April our Bookmans locations host environmental fairs and recycling events to help you stay informed, but we rock Mother Earth all year long and we want you to join us. We’re here to help you find the best ways to support our environment and protect this precious planet, so let’s get started! Let’s start with our magazine section. Bookmans has shelves and shelves of magazine titles that can give you the most up-to-date information. We also have back issues that contain time tested wisdom. Here’s a fun fact, our magazines never make it into a landfill. We keep sharing them until they eventually become an awesome craft or school project. Magazines are also an ideal way to start your new readers off on a lifetime of literary enjoyment. We have kid’s titles that are not only fun, but informative, like Ranger Rick, National Geographic Kids, Zoobooks and Kids Discover. These fun mags cover topics like the solar system, the rainforest, extreme weather, islands and glaciers – all entertaining your child while teaching them fundamentals of science and the environment. Adults can join the action with copies of Hobby Farms, Chickens, Farm & Ranch, Organic Gardening and the classic Mother Earth news. Magazines are the tip of the iceberg for info when you take our book collection into consideration. Bookmans shelves are teaming with titles and displays that cover every aspect of the environment. It’s Easy Being Green by Crissy Trask is a simple, straightforward guide covering the adoption of greener buying habits, finding earth-friendly products, shopping for green products online and cultivating a sustainable environment. The Complete Idiot’s Guide to Saving the Environment by Greg Pahl is a ‘save the planet’ guidebook with expert advice, practical strategies and foolproof ways to be green. If you want to dig a little deeper, grab more involved titles like The Balance of Nature by Stuart L. Pimm. Pimm tackles the hard questions and gives valuable insight into the dilemas of modern life, how we got here and what we can do to reverse the terrible trend we have begun. If your are more of a visual person, get informed with our movie collection. Need a recommendation? You can grab the BBC video The Blue Planet; Seas of Life. From the producers of Planet Earth, which we also recommend, producer Alastair Fothergill and his team give you a breathtaking exploration of the world’s oceans like we’ve never before seen them. You can also attend one of our many exciting events this month and throughout the year because Earth month is every month here at Bookmans. Check out our events calendar for more info. Gain wisdom about this beautiful planet in every department of our store. Learn to love and care for our Mother Earth, and save money while doing it. Grab some of our wide ranging titles to help you get started and use your Bookmans trade credit to do it! As we often say Bookmans is good for the pocket, good for the planet.